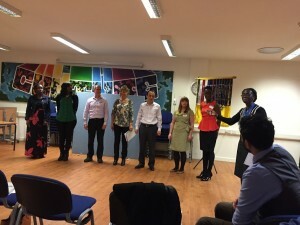 “Every time I am asked why I am involved with Toastmasters International, my reply is something along the lines, ’because Toastmasters are passionate about public speaking and sharing what they know about the fantastic opportunity for personal development that the Toastmaster journey can provide’. This is especially true about our members here at Speakers of Croydon. An important characteristic of our members is that they all have a great ’can do’ attitude and an incredible ability to motivate and inspire. From the visitor feedback we collected at each meeting we knew that there was a demand for more information about Toastmasters, delivered in a more intensive way than we could possibly do at our regular meetings. It was this combination of factors that led us to introducing the Speechcraft program 2 years ago. Speechcraft is part of the Toastmasters International Success Communication Series and are workshops which give prospective new members a chance to see in detail ‘what Toastmasters is all about’. We decided to deliver over 4 consecutive weeks which was really tough going for all concerned but we felt it was the best way to get the maximum benefit from the program. In both years the workshops were booked up pretty quickly after being publicised, and the participants it attracted were a diverse group of people from a wide age range – from students, to those developing second or even third careers. As with all things at Toastmasters International, the workshop material and guidelines are very comprehensive and easy to follow. Our main aim was to deliver workshops that were challenging but fun. The participants were really enthusiastic and committed to fully engaging with the process in terms of the input, time and effort required, and our workshop leaders were excited to use their knowledge and experience to help others starting out on their public speaking journey. The results are a huge win/win. For the individuals that stay the course, their level of confidence has soared and they are committed to achieving their communications goals. For Speakers of Croydon, we have had an influx of new members and the four graduates from February have since quickly gone on to become club committee members – injecting new energy and fresh ideas to reinvigorate our club.